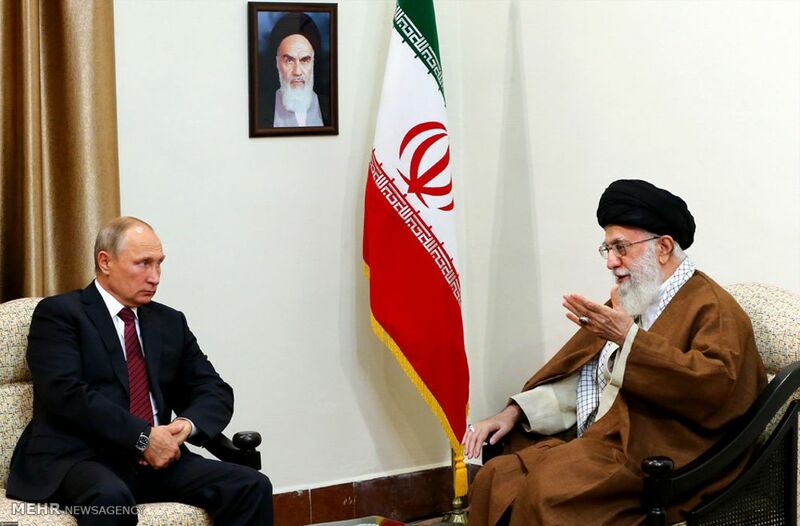 In a major development against US President Donald Trump’s policies, Iran’s Supreme Leader Ayatollah Ali Khamenei has conveyed to Russian President Vladimir Putin that the developments in Syria and the US defeat in the that country show that Washington can be contained. Putin was in Tehran on Friday to participate in a trilateral meeting on Syria hosted by his Iranian counterpart Hassan Rouhani and also participated by Turkish leader Recep Tayyip Erdogan. Russia and Iran have successfully been fighting against terror groups active against Syrian president Bashar al-Assad. Lebanon’s Hezbollah and Iraq have also been extending support to Damascus to fight the menace. The Iranian leader stated that the Americans suffered a real defeat in Syria and failed to achieve their goals. Ayatollah Khamenei also said sanctions imposed by the US on Iran, Russia and Turkey are a very strong common ground for strengthening cooperation, and urged Tehran and Moscow to develop political and economic relations and follow up on the agreements of the summit in Tehran. He stressed the importance of pursuing non-dollar transactions in trade. Khamenei said that Iran has so far remained committed to the nuclear deal reached between Iran and the P5+1 group of countries in 2015. It was implemented in January 2016, when sanctions were lifted against Iran. In a separate meeting with Turkish President Recep Tayyip Erdogan, Iranian leader Khamenei said that closer relations and synergy among Muslim countries are the most important needs of the Muslim world. Earlier in the day, while addressing trilateral summit, in presence of Russian and Turkish Presidents, Hassan Rouhani said that US must swiftly end its “illegal presence and interference in Syria, which has led to the continuation of the insecurity in the country. He hailed the “valuable efforts” made by Tehran, Ankara and Moscow to solve the Syrian conflict and said that three countries need to further continue their cooperation to fully establish peace and stability in Damascus.